President Obama’s visit to India this week supports two great democracies and promises to enhance a long-standing strategic partnership. The India-U.S. Delhi Declaration of Friendship states a commitment to elevate the strategic dialogue to a strategic and commercial dialogue. This reflects the U.S. and India’s commitment to strengthen commercial and economic ties to advance mutual prosperity, regional economic growth and stability. Blue Diamond’s vision is to deliver the benefits of almonds to the world. We look forward to opportunities to continue to bring Blue Diamond almonds into India and support Indian commerce. We hope this visit and Declaration will start to build momentum toward opening more discussion around agricultural issues. Sacramento County Congressman Ami Bera was invited to join the president on this visit to India. His Facebook post provided assurance that Blue Diamond almonds were represented both in brand and as an ingredient in the Almond Joy candy bar peaking from behind our snack nuts. “It’s incredibly humbling to join the President on Air Force One and help represent the United States and Sacramento County abroad in India. 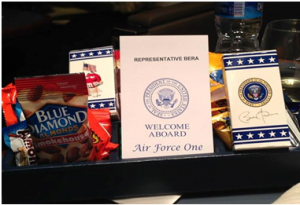 I was glad to see that they were serving locally grown Blue Diamond Almonds aboard our flight!” Bera wrote.